Church Tackle's Double Action Flag System is great for light striking fish. The flag can be adjusted for different lures and speeds by simply clicking the adjustment lever up or down. You can also set the flag to raise when a fish strikes. Easy to install and use. The Double Action Flag is not recommended for use with lead core or copper lines. 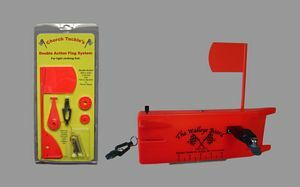 Church Tackle's Double Action Flag System is great for light striking fish. The flag can be adjusted for different lures and speeds by simply clicking the adjustment lever up or down.